Create your own high-spec projection screen/home theater with this high quality VonHaus Projection Screen Material. Made from a combination of PVC and high strength polyester, the material comes in a matte white finish which produces a gain of 1.0, ensuring that the picture can be seen from any angle. The material has a 1.5" wide black strip to improve contrast and picture quality and is suitable for multiple uses, including framing and tripod projection mounting. 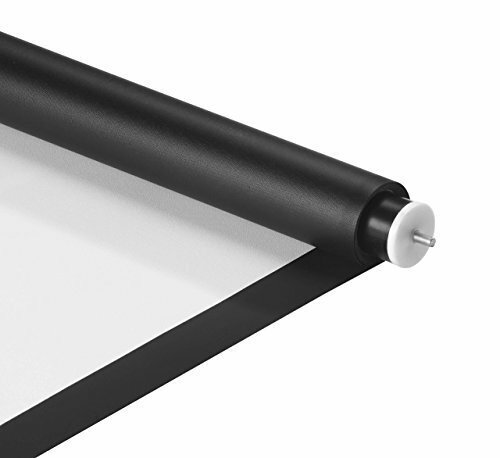 The VonHaus Projection Screen Fabric is pre-rolled onto a high-quality, hard-wearing roller to ensure that it arrives in perfect condition. ENHANCED VISUAL EXPERIENCE: Coated matte white surface with 1.0 gain resulting in perfect viewing. Compatible with most projectors including LCD and DLP. DIY MOUNTING: Can be mounted on a frame of your choice for a custom projection screen. IMPROVED CONTRAST: Features a 1.5" black strip border. NO CREASES: Material is rolled when shipped to ensure it is received without creasing.